At Weldon General and Cosmetic Dentistry, Dr. Weldon provides world class dentistry to the families of Central Florida. We offer the comfortable, relaxed, and caring environment patients of all ages need to enjoy the dental experience. Through the exceptional qualifications and reputation of Dr. Weldon, our office caters to the unique needs of each member of your family from one convenient location. As your family dentist in Ocala FL, we have the services your family needs through all stages of life. As a husband and father, Dr. Weldon understands just how important it is to choose the right dentist to care for your family. When raising a family, life tends to get a bit hectic and busy. As a result, you do not have the time to run to different dental offices for each member of your family. You need a dentist who is able to provide the exact services everyone in your family needs from one location. In addition to simplifying dental care by only having to visit one office, a family dentist also offers many added benefits. All of your family’s dental records are kept in one location. As we get to know your family over the years, we build a relationship with each patient and gain a deeper insight into each member’s oral health. Plus, we are better able to understand how your family’s genetics play a role in your family’s oral health. This allows us to deliver more customized treatments and interventions to protect your family’s beautiful smiles. When it comes to protecting your family’s smiles, the foundation to a great smile starts with the right preventive care. 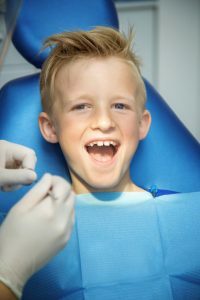 As a children’s dentist in Ocala FL, we provide the early preventive care children of all ages need to ensure the proper development and health of their teeth. In addition to regular checkups and cleanings, we also offer preventive treatments, such as fluoride treatments and dental sealants to stop damage before it even starts. As your child ages, we are able to provide the restorative procedures needed to ensure they have a healthy, beautiful smile that lasts a lifetime. In addition to children’s dentistry, we offer complete preventive care to all members in your family, including dental cleanings and checkups. To keep your family’s smiles looking their best, we have cosmetic dentistry services to give you the most confident, attractive smile possible. For those who need advanced dental care, we offer dental implants and emergency dentistry to promote healthy smiles. Dr. Weldon is committed to improving your family’s quality of life and overall health with the highest level of dental care possible. Holding true to small-town values, Dr. Weldon welcomes your family into his office with open arms to ensure the health and beauty of your family’s smiles for many years to come. If you are ready to benefit from a caring and reputable dentist who will care for your entire family, it is time to call Weldon General and Cosmetic Dentistry at (352) 622-3236.